A complete linear motion system is a combination of a drive system and linear bearing system. 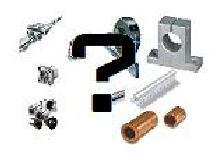 However in this section, this term is referring to the linear bearing assemblies and the associated parts. There is an entire section devoted to the CNC drive system. The term linear motion system will be called the LM system for simplicity. As stated before, the LM system is responsible for three primary tasks. The LM system must be able to handle the weight of the components while transporting it along a linear distance and maintaining linearity. For example, the gantry on a CNC router is supported on a LM system and is able to move along the X-axis. The LM system must support the weight of the gantry and still provide a low friction motion. While supporting a load, the LM system must also provide a precise linear motion with minimal friction. This is the primary task of a LM system. The type of LM system directly related to the accuracy or a CNC router. A sloppy linear motion system leads to a sloppy CNC machine. That is why it is important to have the correct LM system installed on each axis. Aside from supporting the weight of the machine, LM systems must also be able to support secondary loads such as torque or lateral loads, depending on the setup. Some applications of LM systems require only one dimensional load ratings, such as supporting a vertical load like weight. Other applications require multi-dimensional load ratings. For example, the LM system of the Y-axis on a CNC router router is required to support the vertical loads caused by the weight of the Z-axis assemble, and also support torsion forces cause by the cutting action. We will cover more on load ratings in later sections. Every LM system is rated for certain loads and certain applications. Choosing or identifying the right system for your CNC router is a vital ability to have when buying or building. Fully supported LM systems are supported throughout the entire length of the system. This type of system can usually support more load without sacrificing linear precision due to deflection. A quality CNC router will have fully supported LM systems on all axes. Some mid or low range machines use fully supported systems on the X and Y-axis while using end supported systems on the Z-axis. As the length of an axis increases the more vital it is to have a fully supported system. Examples of these systems include linear rails and guide blocks as well as track rollers. Partially or end supported LM systems are just what they seam. These systems are supported on their ends. These systems are due to flex and deformation because of the machine weight or the forces applied. However, these systems are more suitable in some applications. The most common type of end supported LM system is the linear rod and bushing setup. Of course each category contains many different types of linear motion systems which will be covered in their respective sections.